To commemorate the occasion we decided to bedazzle our running shoes. So if you're running the race, and you see these shoes, say "Hi"! I'm thinking I may have the only cupcake and daisy bedazzled running shoes in the race. just as long as I do! I hope you have a magical weekend too! I'll back with the Eventide update on Tuesday! 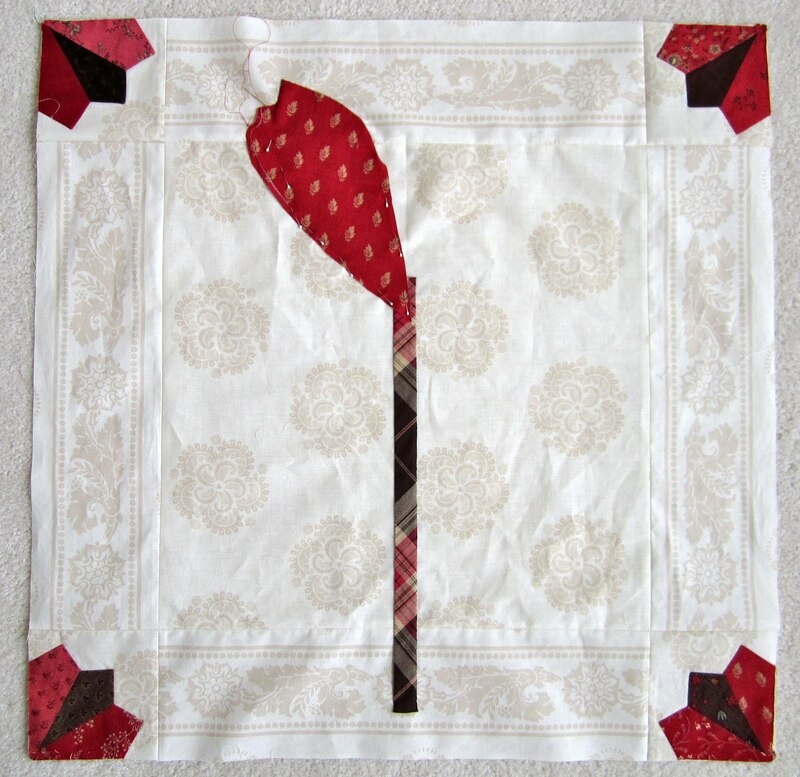 I have just a little more information to share on Evening Bloom, my hand applique project. First, I took this picture to give you a sense of the size of the blocks, which are 24 inches. 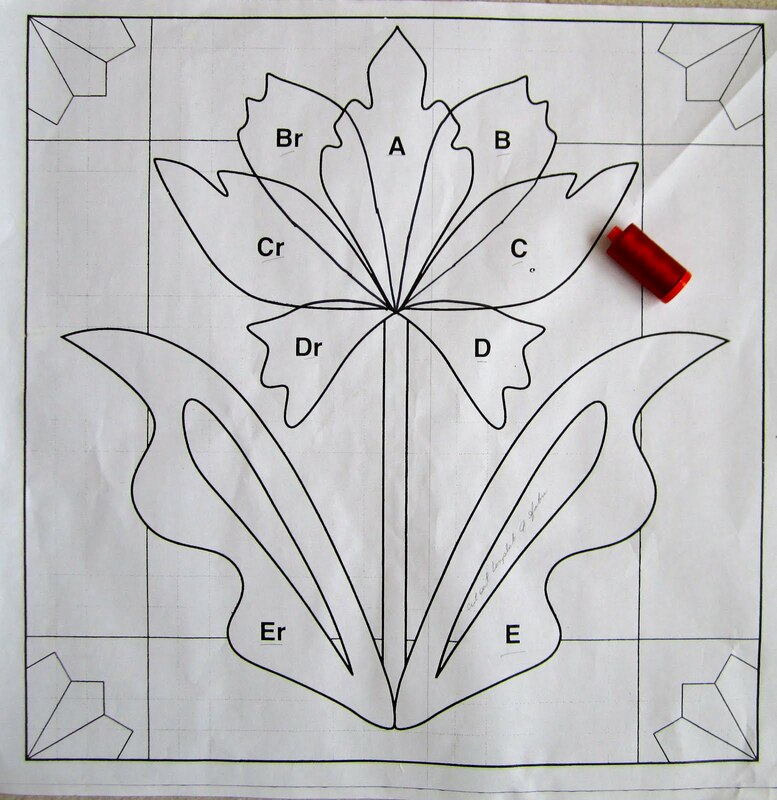 I have one of these pattern sheets for each block. I use it to trace the pattern pieces onto freezer paper. I cut it out, leaving a reasonable amount of fabric, and trace around the wax paper, that's how I know what to turn under to get my shapes. without having to draw the pattern on my background fabric, leaving marks that may or may not get covered with the pattern piece, or may or may not wash out. 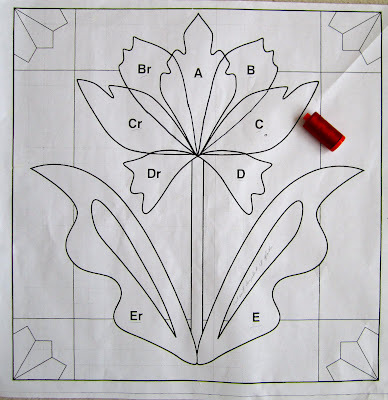 When I fell in love with the pattern Evening Bloom, and read the book's directions for needle turn applique, I immediately knew I would need additional help with the whole process. I had absolutely no background knowledge on this method of handwork. 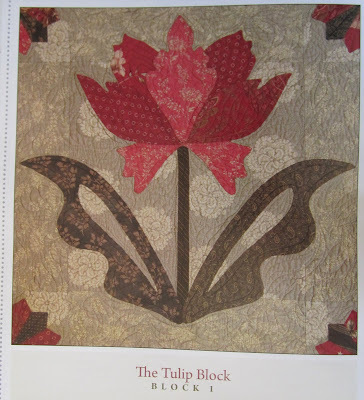 So I contacted a fellow quilter who teaches needle turn applique classes. As luck would have it, not only was she willing and eager to teach me how to applique, she was planning to make Evening Bloom and had even already purchased her fabric. We decided to work on this quilt together (yeah, another sew along!) and immediately made plans to meet for my first lesson. 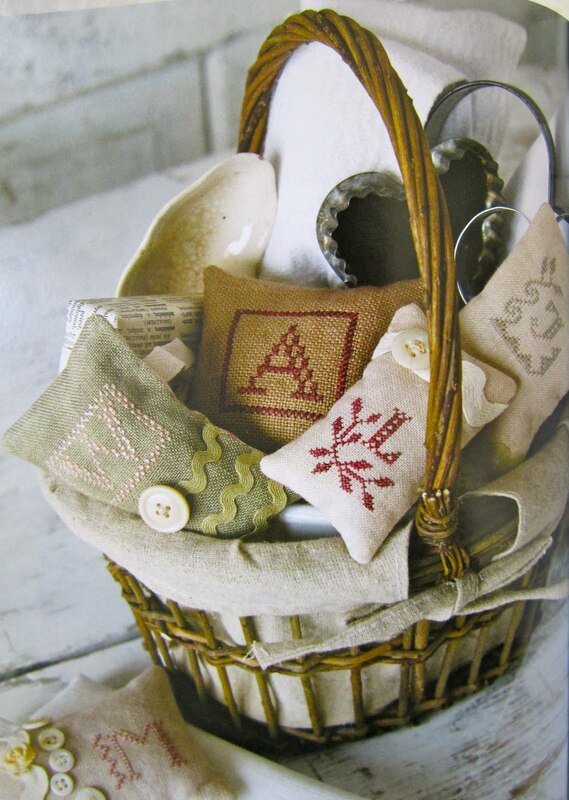 In addition to miscellaneous applique accoutrements, my applique teacher brought this to my first lesson. A hot chocolate cupcake with vanilla peppermint icing. A moist, sweet, delicious cupcake with a marshmallow center. A cupcake from one of the best cupcake bakeries in New York City, we live in Illinois. 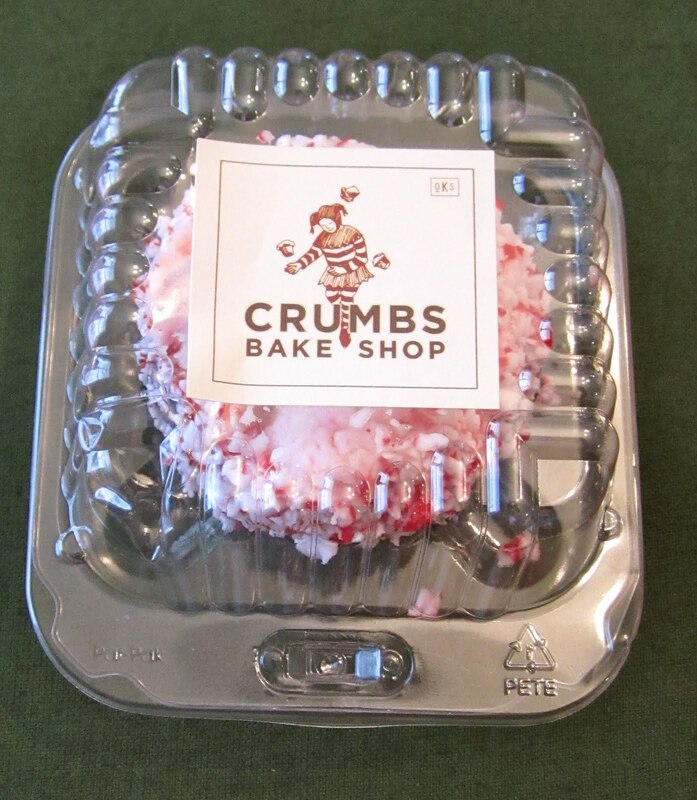 She bought this cupcake, carried it all over the streets of New York, through airport security, and them home, to give to me. Needless to say, we get along pretty good!! 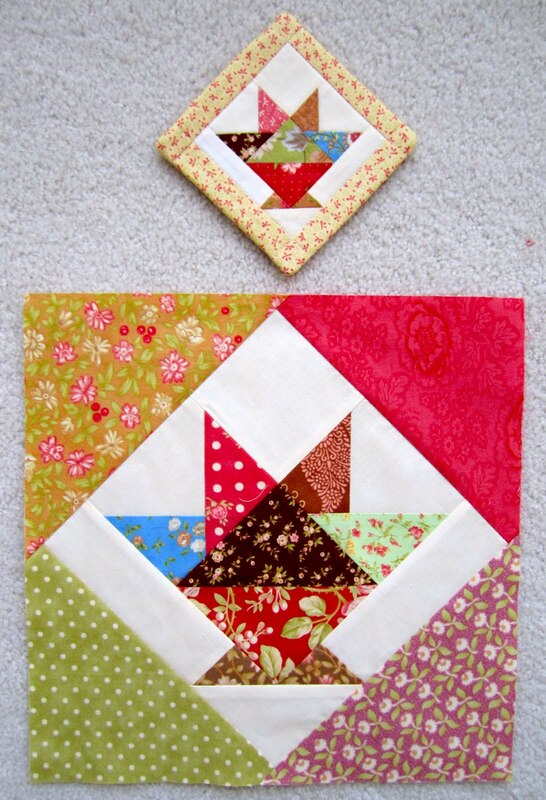 my patient, skilled, generous, and knowledgable applique teacher's block is on the left. Marianne, thanks so much for all your help, I could not have done it without you. It's Tuesday, time for another Eventide Sew Along update! 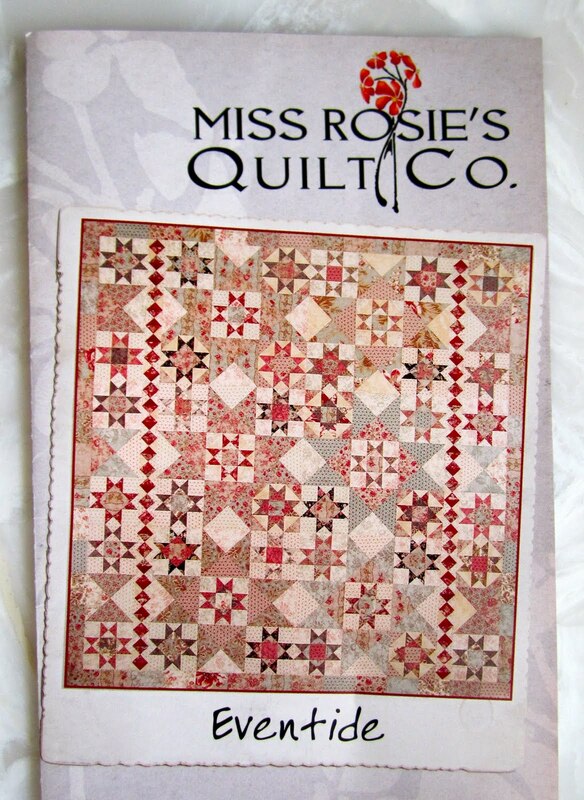 Eventide is a lovely pattern by Carrie Nelson for Miss Rosie's Quilt Company. I was lucky enough to find 31 other quilters just looking for an excuse to make this quilt too! It's not too late to join, send me an email or leave a comment if you're interested! First, I think I finally have my sew along list in order, but if you've been omitted or added in error, please contact me. I've added all participants to the Eventide list on the left. Nicole, at Sister's Choice Quilts, who's using a mix of Lecien fabric but mainly Antique Rose for her Eventide, posted a very helpful blog regarding fabric choices for Eventide, be sure to read it if you've not done so. It's worth reading even if you aren't making Eventide. Choosing fabric is definitely my biggest struggle when making most quilts. Today Nicole is providing a tutorial on how to make the hour glass blocks for Eventide, another reason to pop over to her blog. Nicole, thanks so much for providing such wonderful posts for Eventide, your tips have been a big help to me! Sinta, at Pink Pincushion, blogged about an Eventide finish, not hers, but an amazing quilting job on someone else's, take a look and be prepared to drool! Judith, at Smokey From the Netherlands, blogged about her participation in the sew along, in two languages! She's using Roses the Noel as her fabric for Eventide. 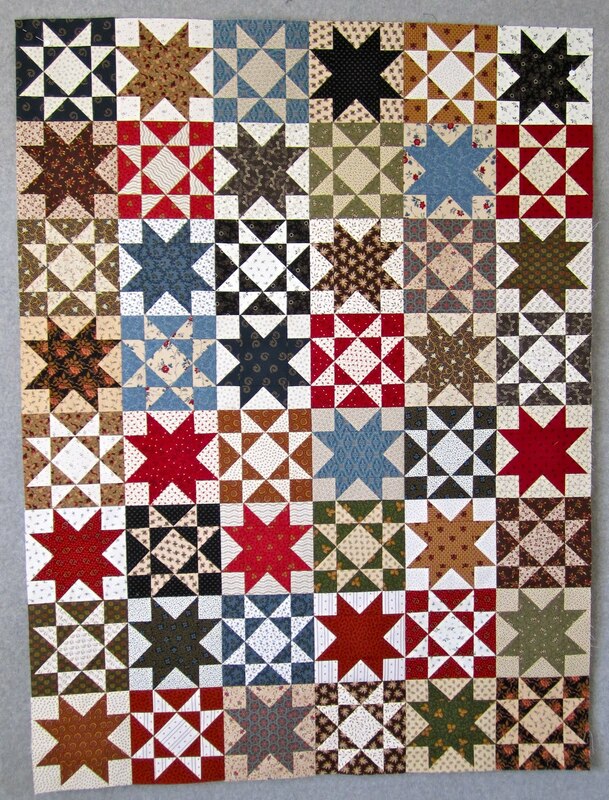 Paula, at How to Make an American Quilt, has cut out and sorted all her Luna Notte fabric and started piecing the Ohio Star blocks, her design wall is looking pretty good, take a look. Gretchen, at Stella Bella Quilts, has her Eventide pattern and fabric, I'm eager to see Eventide using her fabric choice of, are you ready for this, Central Park! Sue, at Cozy Little Quilts, has also made her fabric selection, Luna Notte, and her first Ohio Star Block, take a look! 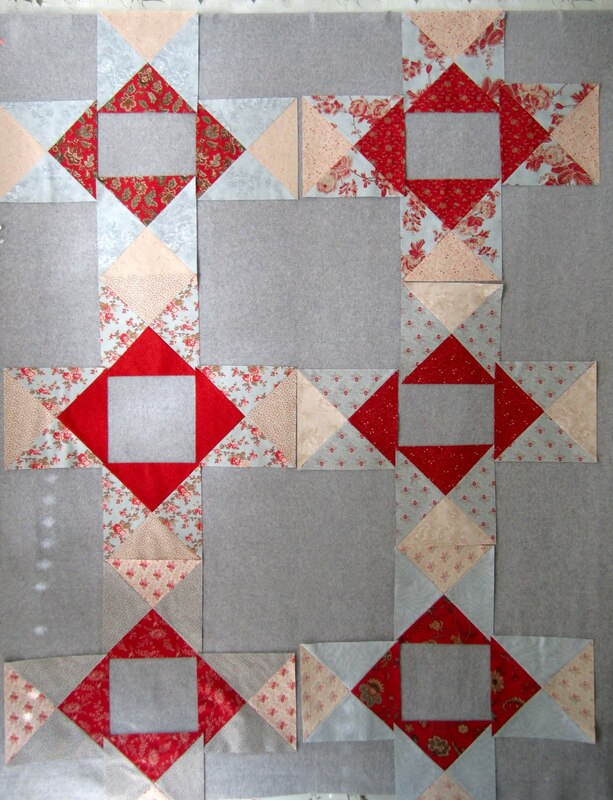 And finally Beatrice, has posted some pictures of her Eventide progress. She's off to a great start, her hour glass blocks are all done. I think that's all the posts I've caught for Eventide progress, if I missed you this week, I'll make up for it next week. and Leona is going to let the fates decide her choice, she's ordered Antique Fair and Park Avenue, whichever fabric arrives on her doorstep first, that's her choice. I wonder what will happen if they show up the same day! So that's all I've heard so far as far as fabric choices go, but we have a wonderful assortment already. What an amazing parade we'll have!! I wish I could tell you why.....and that's the part that drives me crazy, I'm not a why person. I'm a rule follower, which is probably why being an Accountant fit me perfectly, no whys in Accounting, it's all about following the rules. But I'm wanting to understand why I do and don't like my fabric choices, it would be so helpful, a real time saver, and easier on my budget if I could determine my likes and dislikes before I cut and piece the blocks. Here are 6 more sets of hour glass blocks that did not meet my expectations. And here are 6 sets that do. I'm now trying to decide if the only reason I picked Park Avenue was because of the blue, and the pattern had the large star points in blue. After making so many poor choices, I'm beginning to think it's not my fabric choices that aren't appealing to me as much as the blue star points. I'm now wondering if I wouldn't prefer those star points in caramels or tans. I think the only way to determine if I'm going to like this look is to finish the quilt with the blues, and even then, I wonder if I'll be thinking that I could have made a better fabric choice. Note to self, before you start cutting and piecing your Eventide, or any pattern for that matter, remember, you can choose any fabric that appeals to you for any aspect of a project, the picture on the cover of the pattern is just a suggestion, a pretty good suggestion, but just a suggestion. Oh well, now it's on to the 42 Ohio Star blocks for me. I think I"ll make a few, to get a feel for the fabric, then go to town on cutting all pieces and parts for the remaining blocks, or at least that's my plan for today! Denise in PA, you're the winner of the Pom Pom Charm pack giveaway from last week, send me your address and I'll get that lovely fabric in the mail to you! 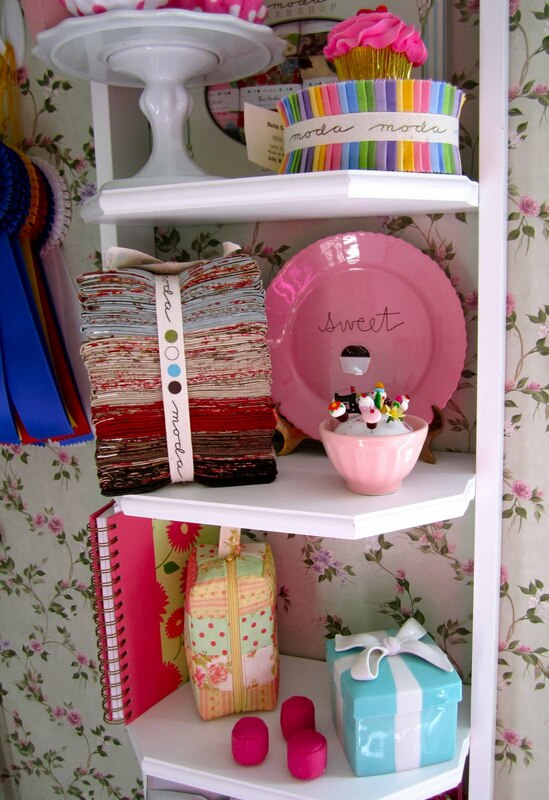 Beatrice - You're this week's Sew Along winner of any Carrie Nelson pattern from the Fat Quarter Shop!! Added later - I just learned today is Beatrice's birthday, so she's a winner AND a Birthday Girl, so drop by and wish her a Happy Birthday, and if you can say Happy Birthday in French, that would be great, Beatrice is joining our sew along from France and has selected Due South as her Carrie Nelson pattern!! If you wold like to win a Carrie Nelson pattern of your choice from the Fat Quarter Shop, leave a comment on this post by midnight, CST, Wednesday, February 23rd. and Eventide Progress Day! So for the next 7 weeks, Tuesday on my blog will be all about the Eventide Sew Along. Welcome quilters who are participating in the sew along, and welcome folks who are going to be cheering the participants on from the sidelines. I hope it makes for fun and interesting blogging for all of us. First - The Fat Quarter Shop has a new shipment of Eventide patterns, if you've been searching for a pattern, your search is over! 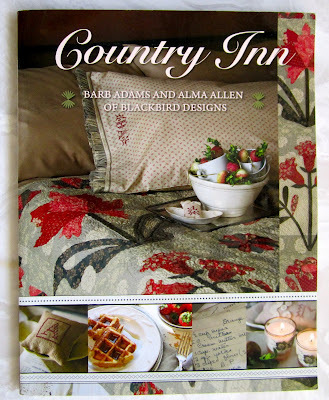 The pattern is online and available. Thanks Kimberly! 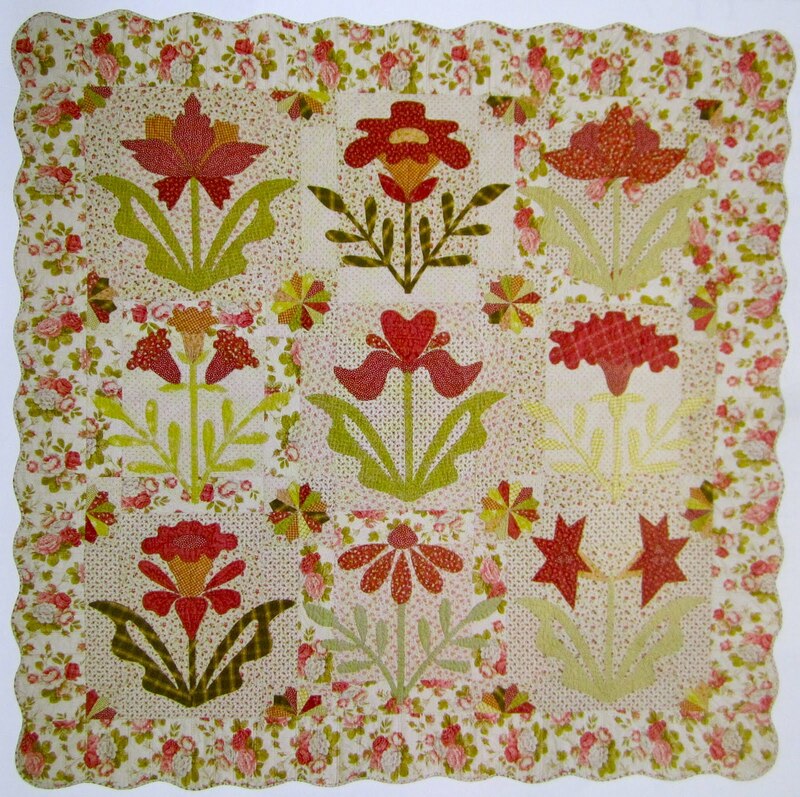 Eventide is by Carrie Nelson for Miss Rosie's Quilt Company and finishes at 84" X 87". I've gotten a few notes that some folks are a little intimidated by this pattern and not sure how to start. I've had my issues with some patterns, patterns that are poorly written or just plain wrong, those are patterns that should scare you. In its simplest form, Eventide is just a nice size quilt comprised of 72 nine inch finished blocks, an inner border of quarter square triangles, and an outer border of scrappy strips. A very basic pattern. It's the fabric that does all the work, well and Carrie did a little work, coming up with the clever idea of how to place that fabric. If you're still overwhelmed, it gets even simpler, of the main 9 inch blocks, 42 are Ohio Star blocks and 30 are quarter square triangle blocks. And if that still sounds overwhelming, break it down some more, and keep breaking down each step until you get to a level that feels comfortable to you. 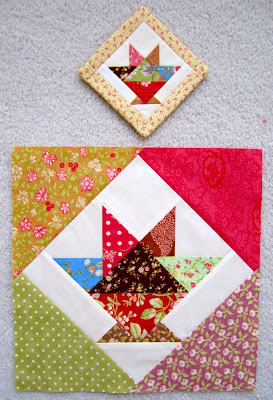 Maybe even cut and piece one Ohio Star block, just to get a feel for your fabric choice and the piecing. Now for the cutting, some folks start a project by cutting all the fabric at once, as Nicole blogged about yesterday. She even sorted her fabric and put the different pieces in marked bags! Very Clever Nicole!! It's not very often that I even look at the cutting requirements for a pattern. I'm a cut as I go type of girl. Especially when I'm not sure of my fabric choices. There's nothing worse than cutting out an entire project only to start and realize you don't like your fabric or the pattern. I have some lovely poppy fabric that is all cut out for a pattern I changed my mind on, Im still looking for the perfect pattern that will somehow use the pieces that I've cut. So don't be scared, just get started! And if you make a mistake, we won't know unless you tell us!! I've got some exciting news, Kimberly from the the Fat Quarter Shop is donating a $50 gift certificate to our sew along. We'll have a drawing from the finished quilts to determine the winner. I'm still sorting out our participant list, drop me a note or leave a comment if there is an error. I'm not intentionally leaving anyone off, don't be shy about telling me I've made a mistake! AND it's not too late to join us! I should have the participant list nailed down this week and will create a list for a column on my blog. 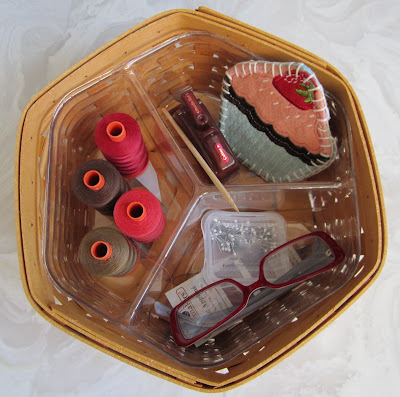 In the meantime, Nicole and Paula have blogged about the sew along, and Sherri has a giveaway going on at her blog today. A very impressive group and great mix of bloggers and non bloggers, I'll do the blogging for the folks without blogs. Next week I hope to be able to share the fabric choices of all the participants. A charm pack of Pom Pom de Paris by French General. If you would also like to win a Pom Pom Charm pack, leave a comment about how you attack a new project or how you cut out a new project, are you a cut it all out at once quilter or a cut as you go quilter? You have until midnight CST, tomorrow night, February 16th to be eligible. Thanks for stopping by, I've finished my first block for my needle turn applique project, look for that post later this week! With Belle Meade done it was on to my next project. After working with nothing but French General reds, whites, and blues, I was in the mood for some different colors. So I went with this . 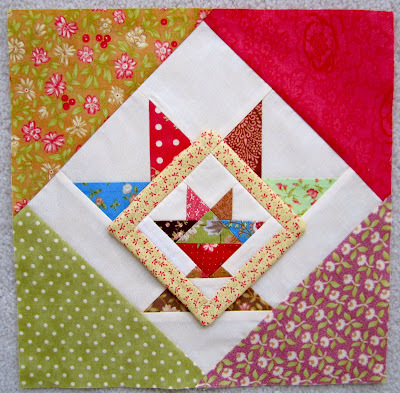 . .
Virginia's Star Quilt by Lori Smith for From my heart to your hands Quilt designs. My favorite part of this pattern, it comes with 5 different quilt size options. The star block can range in size from a 4 1/2 inch square to a 10 1/2 inch square, and this pattern has detailed directions for each size. So here are all my stars . . . I wish I could take credit for choosing all that lovely fabric, but this project is the result of a kit, a kit I've had for several months. This project was kitted for the 6 inch square blocks, so that's what I went with. I wasn't particularly fond of the border provided in the pattern, a 6 inch piece of plain fabric with a star in each corner. I thought I could come up with something a little better ( you know me and borders) and thought maybe a scrappy checkerboard inner border would have a good look and feel. 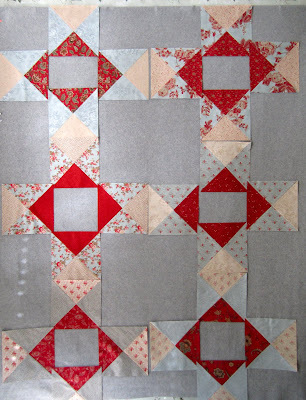 It didn't take long to figure out that the scrappy checkerboard border fought with the scrappy stars, so back to the drawing board......I was a little limited since this was a kit, and I really don't have much in the way of fabric on hand. so the binding became the border! I'm still deciding on the perfect width for plain tan inner border, and plan to add another plain strip of fabric to the other side of the checkerboard border. I'm also still deciding about whether to add the hst units along the outside, like the pattern. This I am sure of, I ran out of fabric! The kit didn't come with enough fabric to finish the border using my pattern changes!! I was able to order more of the dark fabric from the quilt shop where I got the kit, the plain tan border fabric, it's available, but the color is a little different. It has a hand dyed look that probably changes on each bolt. Luckily for me, I know a quilter who had also bought this kit and she is willing to part with her border fabric so I can finish mine! Aren't quilters the nicest bunch of folks you would ever want to meet! So while I wait for more fabric to finish this project, I guess I'll get started on Eventide! Stop back tomorrow for an update on my Eventide progress and some sew along updates!! I'm wearing my Valentine's Day socks and eating red food all day. I just love it when I have to eat Red Velvet Cupcakes for breakfast, just in the name of a holiday! I'm all for any holiday that adds a little fun to what would normally be another boring winter day. If a valentine doesn't find its way to you, don't hesitate to treat yourself to a little something....it's all about love, and shouldn't you give yourself a little love everyday, but particularly this day!! First, to all the folks who have so much snow that they have to actually shovel their roofs, I am so sorry I complained about my measly 22 inches!! I don't even shovel my drive, is there a service for that type of thing.....I can't imagine getting up on a slick roof to shovel snow. No more complaining about snow from me, no sir......now the temperature, that's another matter, today it's 0! 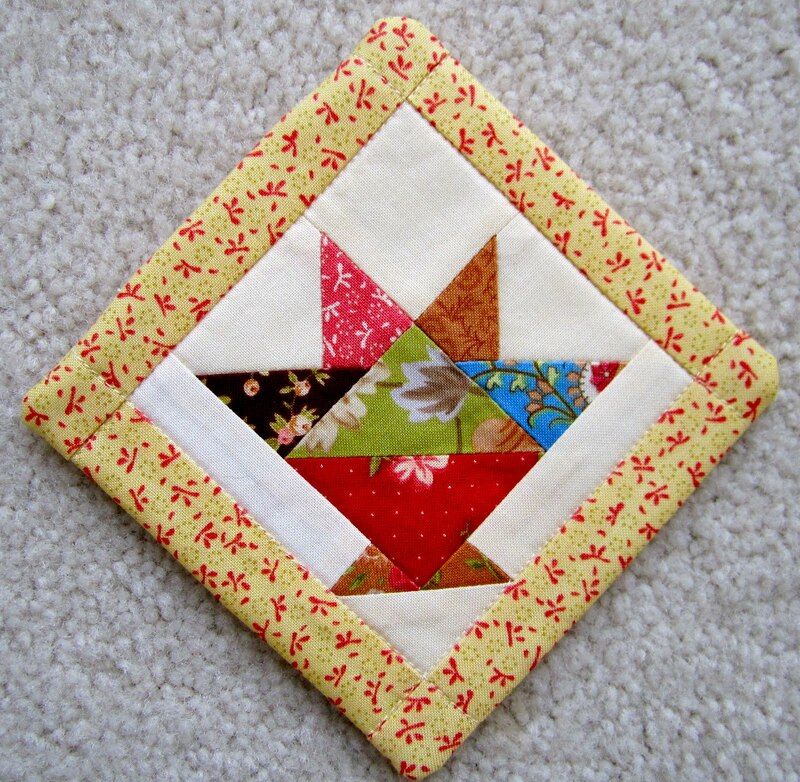 I'm so excited, it appears as if we have around 25 quilters up for an Eventide sew along! At first I was amazed by the number of folks who said they would participate, but then it is an amazing pattern. And for a Carrie Nelson pattern, pretty low on the pieces scale, only around 1,115. If you want to join us, and I missed you, just leave a comment or send me an email, cupcakesndaisies@gmail.com. If you're on the list in error, I'm sorry, leave me a comment or send me an email and I'll remove you from the list. Anita, Mary, A, and Cheryl. You left comments saying you wanted to sew along but I don't have a way of contacting you, please send me your email address. I'm happy to do the blogging for you. I have a few more folks still thinking it over, quit thinking, come on and join us, and send me an email or leave a comment so I can add you to the list. Here are the rules, start when you want, finish when you can and if you finish by the end of March, 2011, you get a mug rug, made by me! We'll also have other drawings as we go. Oh, and a prize for the first person done, piecing the top. Shelley started this project with Carrie in Wisconsin, so she has a head start....just throwing that out there for you competitive types!! I plan to blog about the Eventide Sew Along every Tuesday. Feel free to blog about your progress when it suits you. If you have a blog, I'll link to it. I just love the parades that Sherri and Sinta have for their monthly sew along, so let's do the same, have an Eventide Parade the last day of March. That's it! What could be more fun! Added later - If you are looking for an Eventide pattern, the Fat Quarter Shop will have them online in the next 24 hours or so. 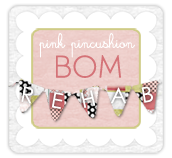 Also, Kimberly from the Fat Quarter Shop has donated a gift certificate for our sew along! Thanks Kimberly, that's very exciting news! 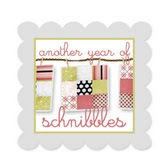 The fun just keeps happening and I've yet to even unwrap my fat quarter bundle! Jayne - of Jayne's Quilting Room. Congratulations Jayne, and thanks to all who stopped by and left a comment. 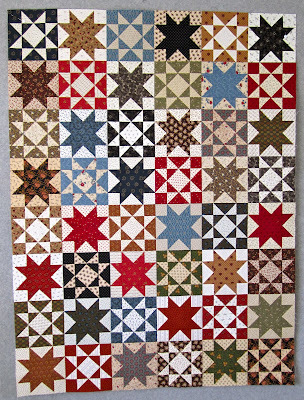 Virginia's Star Quilt by Lori Smith of From my heart to your hands. I just need to finish the stars, sew them together, and add the border. Depending on how Virginia's Star progresses, I'm hoping to start Eventide the end of next week. Someone asked about my progress on my needle turn applique project, I'm loving it and am still working on my first block. I would show you my progress, but I get the idea that appliquers blog about their applique when they finish a block, and I'm new to the club and don't want to break any rules, so hang in there, there will be a applique block to share soon. Wow, I can't believe not only is it February, but the first week of February has already passed. The weather here has been brutal, so I'm all for February going as quickly as possible. One of my 2011 quilting goals was to take a little time after finishing each major project to spend some time playing with the scraps and work on a little project...and I did... I spent the last day of January playing with my A la Mode scraps. Here's my first mug rug....on the rug, with no mug . . . I don't think I'll ever put a mug on this rug. I had a fun and relaxing afternoon making it, a nice change of pace. I made the same basket block that I made for A la Mode, I just cut it in half. Here's the original block with the mug rug block. After I made the small basket block, I realized it would have fit in the center of the large basket block! Wouldn't that have been cute, to put some little baskets in the center of some of those larger basket blocks! It's too late for me now, no more changes for A la Mode, it's done! But if you're thinking of making that basket quilt give it some thought! I'm sure there are tons of these pictures out there, a view from my deck. It's going to be very cold the rest of the week, so I'm guessing my view won't be changing anytime soon. 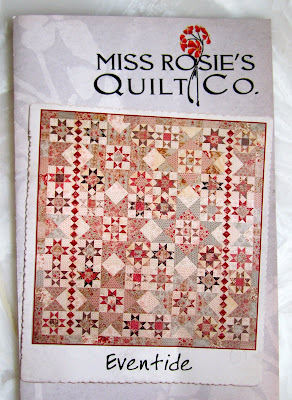 Eventide by Carrie Nelson for Miss Rosie's Quilt Company. This quilt finishes at 84" X 87" and is made up of 9 inch blocks.....THANKS CARRIE, I just love 9 inch blocks, 12 inch blocks seem to be very popular in patterns, but I prefer 9 inch blocks or smaller, so right off the bat, I won't have to "Thelma Size" the pattern. I've been eager to start this project ever since I saw the finished quilt while taking classes with Carrie Nelson last fall. I love how the border doesn't really seem like a border and the subtle large stars in the background of all those small stars. In the hopes that I can talk one of you out there into sewing along with me, I'm giving away an Eventide pattern. If the Fat Quarter Shop will ship it to you, then you are eligible to enter. So far this winter, we've had 22 inches of snow, in your comment just let me know if you've had more or less snow at your house. If you win, you don't have to sew along with me, but it sure would be fun! You have until midnight CST, tomorrow, February 9th, to leave a comment, I'll announce the winner on Thursday.